Are you searching for a gorgeous gown for your wedding day? 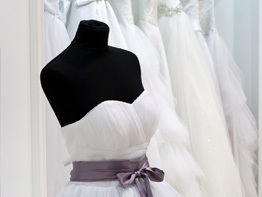 At Ideal Bridal and Dry Cleaning, we know that it’s not always easy to find that perfect dress. It’s important that it reflects your style, your personality, and most importantly, compliments your body type and features. For over 25 years, we’ve been designing, customizing, and discovering amazing wedding gowns - because we’re passionate about helping bride’s wedding day dreams come true! At Ideal Bridal and Dry Cleaning, we specialize in finding unique wedding gowns from around the world that you can’t find anywhere else – and all at affordable prices! Not only do we offer a comprehensive inventory of stylish dresses here in our Livonia bridal shop, but we also sell our own line of customizable gowns. And, if you can’t find that perfect fit - rest assured - we’re experts at providing custom tailoring and gown alterations! When you come to us for your wedding gown, you can choose from dozens of styles, lengths, fits, and accessories to design a custom dress and look that’s all your own. No two brides are the same, and our unique and personalized collection is guaranteed to satisfy a range of styles. Let Us Outfit Your Entire Bridal Party with Breathtaking Gowns! 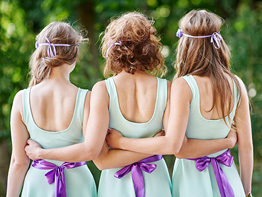 We know how difficult it can be to find a look that will compliment your entire bridal party. Whatever you style you choose – whether it be strapless, sleeved, empire, drop-waist, floor-length, cocktail… you name it, we have many options to choose from. Our beautiful dresses, combined with our custom tailoring and alteration services, will ensure that whatever style you choose will look flattering on every member of your bridal party. To more information about our bridal services, or to schedule your free bridal consultation, contact us today. We’re excited to help make your wedding day as perfect and beautiful as you’ve always dreamed it to be! Our store is conveniently located near Novi, Northville, Westland, Farmington, Farmington Hills, and the surrounding Southeast Michigan areas.